Hi and happy Tuesday to all of you. For my card today i wanted to create something that was really simple to do with just basic papers and flowers. And i picked this die set because using solid paper really helped to make all the details stand out when i embossed it all. It was so fun to cut and layer lots of pieces on it... and they all mixed together wonderfully. I hope with all of our ideas each week you are trying to mix all your dies to make new creations too. 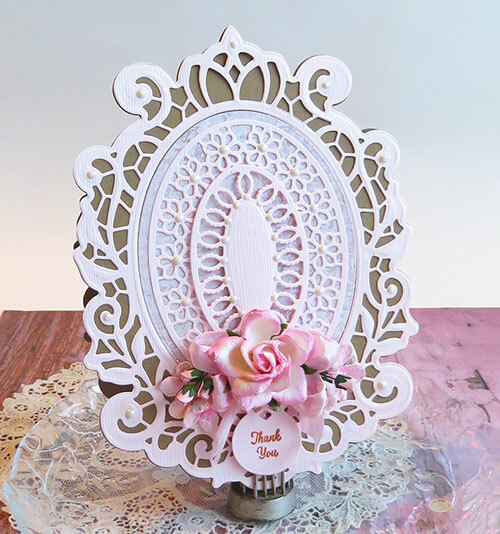 To make my card I used Becca Feeken's Victorian Crest Die Set for my base in both kraft and pink. 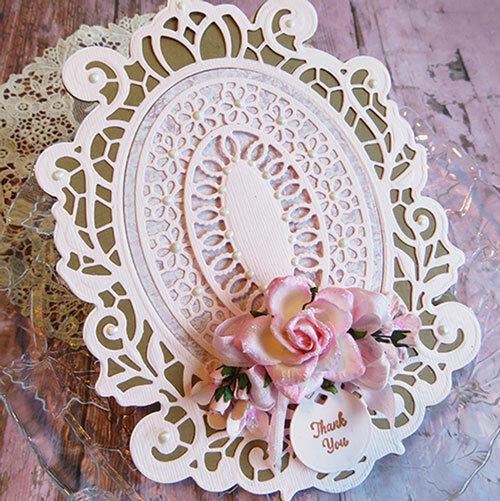 Then I added the die cut from the Hannah Elise layering frame in the center of it all and one of those adorable tags from the Tiny Tags Stamp and Die set under the flowers to add a quick and simple sentiment. And to finish it I added some liquid pearls to all those beautiful little flowers and other intricate swirls that were just calling for me to fancy them up. It was super quick and you could easily change the sentiment to one of the others in the stamp set for a different occasion. And colors too. Get out all those scraps and get a few cards made up to send quick....it always makes for a relaxing afternoon. Thanks for stopping by today and be sure and stop over at Becca's Blog to see what all the design team is sharing this week. There are lots of new ideas and we have a new team member too!! What a beauty Teresa!! This is gorgeous!! Thank you for your sweet kind words... I am glad that you love Becca's dies as much as we do.